This time last year, we were feeling the warmth of a coming global spring. This year, we see comrades from Egypt to Indonesia to Mexico attacking the state in capital. There’s a palpable tension between the authorities who keep cracking skulls and those rebels who continue to fight back. 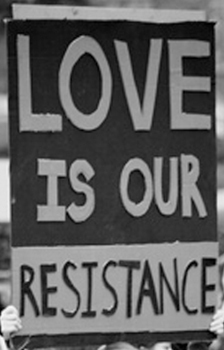 And for those rebels, still in the streets, or locked in a prison cell, we hold revolutionary love. With that love burning in our hearts, we host another of our every-other-week political prisoner letter-writing dinners. This time last year, we were buried under ice, winter unrelenting. This year, we are feeling the warmth of a coming global spring. There’s a palpable tension between the authorities who keep cracking skulls and those rebels who continue to fight back. And for those rebels, still in the streets, or locked in a prison cell, we hold revolutionary love. With that love burning in our hearts, we host another of our every-other-week political prisoner letter-writing dinners. This week we’re having a belated Valentine’s Day card writing party for PPs and POWs in the region. But rather than looking to a holiday based on Christian martyrs from millennia ago and kept alive through consumerism and romantic coupling, we’re celebrating revolutionary love and solidarity. We love our imprisoned comrades and use this week’s card-writing night to manifest that love. Not to sound like a broken MP3, but this weather. We’re expecting another round of freezing rain and snow. Just a couple of weeks ago, it was so bad that a fire under the street knocked out the power for our regular letter-writing spot. And yet folks turned out. We had a great time, wrote some letters, and talked about PPs and POWs. So why not brave the cold again this week? It’s going to be worth it. This week we’re having an early Valentine’s Day card writing party for PPs and POWs in the region. But rather than looking to a holiday based on Christian martyrs from millennia ago and kept alive through consumerism and romantic coupling, we’re celebrating revolutionary love and solidarity. We love our imprisoned comrades and use this week’s card-writing night to manifest that love. The deal, as always, is that you come bringing only yourself (and your friends and comrades), and we provide you with a delicious vegan meal, information about the prisoners as well as all of the letter-writing materials and prisoner-letter-writing info you could ever want to use in one evening. In return, you write a thoughtful letter to a political prisoner or prisoner of war of your choosing or, better yet, keep up a long-term correspondence. We’ll also provide some brief updates and pass around birthday cards for the PP/POWs whose birthdays fall in the next two weeks thanks to the Anarchist Birthday Brigade.